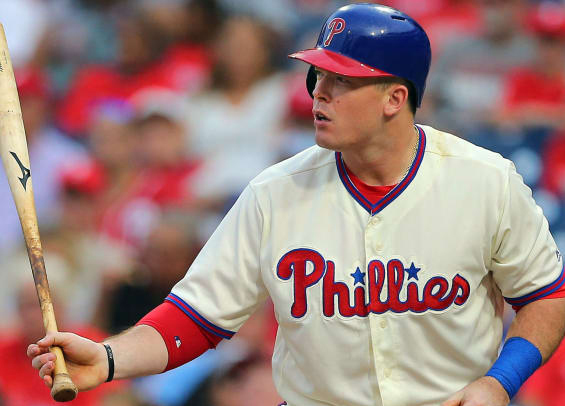 According to sources, the Philadelphia Phillies have placed first baseman Justin Bour on waivers in an effort to open up a slot on the 40-man roster. Jim Salisbury of NBC Sports Philadelphia broke the news Wednesday, hinting at a potential roster shift for the Phillies. Hearing Phillies have placed 1B Justin Bour on waivers as they trim 40-man roster ahead of Tuesday's Rule 5 protection deadline. The Phillies acquired Bour in August in a deal with the Miami Marlins. In 29 appearances with Philadelphia, he hit just .224 with a homer and five RBIs. He has a ton of power but he's also limited defensively, and with the potential move of Rhys Hoskins back to first base the club viewed him as expendable. The 30-year-old is a career .260 hitter with 84 homers spanning five seasons. Waiving Bour leaves the Phillies with six open spots on the 40-man roster.